(This is a guest blog by Margaret Walton-Roberts, the co-editor of The Human Right to Citizenship: A Slippery Concept, published by the University of Pennsylvania Press, which I announced in my blog of July 7, 2015 (https://www.blogger.com/blogger.g?blogID=6700283514603333187#allposts). In this blog, Margaret expounds on the Dominican Republic’s current deportations of people of Haitian descent, a case I mentioned briefly in my introduction to the book). In recent months I have been struck by the relevance of The Human Right to Citizenship. In September 2013 the Dominican Republic (DR) issued the Tribunal Constitution Resolution 168/13, which retroactively removed citizenship from a Dominican-born woman of Haitian descent, after which the court demanded that all similar cases be noted and that those individuals be defined as foreigners. in Djabon, Dominican Republic, 07 January 2013. In response to this ruling the DR government passed The Naturalization Law (169-14). This Law states that anyone born in the DR to Haitian parents since 1929 is no longer automatically a DR citizen, but creates some pathways to legal residence. This process rendered approximately 250,000 Dominicans of Haitian descent stateless. The retroactive stripping of citizenship created chaos. International condemnation of these rulings argued that the retroactive application of 168/13 is arbitrary deprivation of the right to nationality, in violation of Article 20 of the American Convention on Human Rights, Article 15 of the Universal Declaration of Human Rights, and Article 24(3), together with Articles 2 and 26 of the International Covenant on Civil and Political Rights (ICCPR). After international outrage the DR created the Plan Nacional de Regularización de Extranjeros (National Regulation Plan for Foreigners) in November 2013, so that those born in the country to undocumented Haitian parents could apply for foreign resident status and after two years apply for naturalization. While over 250,000 have taken up this opportunity, many have not, fearing that identifying themselves as foreign residents will merely speed up their deportation to Haiti. Some are also excluded from this process because they do not have official documentation to prove their status. 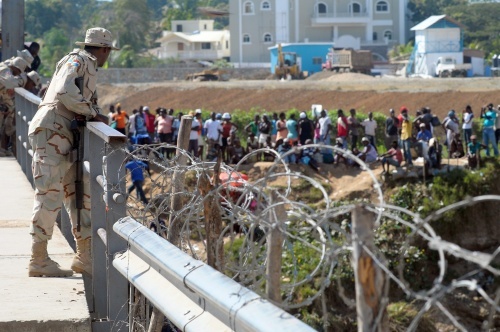 Stripping the rights of those born in the DR but of Haitian descent has also reverberated through the large population of Haitian migrants in the country. To address this population’s status the DR stated that Haitians living in the country who could both prove their identity and prove that they arrived in the DR before October 2011 were eligible to apply for residency. There are an estimated 460,000 Haitian migrants in the DR. This option for migrants who have lived in the DR to claim residency has also been difficult for many to pursue, since securing the necessary documentation to prove their status and time of arrival is complicated, in part because many of the Dominicans who employed Haitians are unwilling to officially admit to this fact. While some DR officials have tried to calm people’s fears about imminent deportations, The Guardian reported (http://www.theguardian.com/world/2015/jun/16/dominican-republic-haiti-deportation-residency-permits) that that the country’s director of migration had told the local press that 2,000 police and military officers and 150 inspectors had received special training for deportations. In the first quarter of 2015 the DR reportedly deported 40,000 people to Haiti under operation Shield. The very name shield indicates that the DR has invoked national security as the justification for these expulsions. In our book we examine how this discourse of securitization has stripped people of their rights and how it operates not only on the borders of states, but also from deep within the social fabric of the nation: Resolution 168/13 also illustrates another assertion our book offers, that we are increasingly witnessing the creation of differentially protected subjects under conditions of increased mobility and displacement. It is absolutely no surprise that people will seek out refuge and livelihood opportunities outside of Haiti: their immediate neighbour on the island of Hispaniola offers an obvious option. Haiti’s relationship with DR is certainly tumultuous, but communities of Dominican and Haitian ancestry have successfully lived together for decades. Despite this co-existence, xenophobic hatred is already occurring against those who look Haitian: in February 2015 a young black man was lynched and left hanging in a tree in Santiago. The DR and Haiti share the Island of Hispaniola, the site of the first European settlement in the Americas. After Columbus landed there the indigenous Taino populations were massacred or died of disease, and by 1503 the colony was importing African slaves. Slaves achieved independence from their then French rulers in 1804, but international boycotts by the US and Europe forced Haiti to pay reparations to its former French enslavers. The Dominican war of Independence in 1844 secured the independence of Dominicans (a Spanish term referencing those from Santo Domingo) from Haitian rule, and subsequent years saw numerous conflicts between Haiti and the DR. Part of the justification some DR residents offer to support the current deportations of those of Haitian ancestry emerges from a discourse of anxiety linked to the nineteenth century history of Haitian dominance across the island. This case thus illustrates many of the arguments we make in The Human Right to Citizenship about how citizenship is a slippery concept that reflects national narratives and how the right to citizenship can be subjected to reconstruction through legislative whim. The history of the Island of Hispaniola offers some guidance as to why hundreds of thousands of Dominicans of Haitian descent can be so easily stripped of their citizenship rights. But the responsibility of the state to protect the human rights of those who reside within their boundaries must now be the focus. Haiti is already declaring it will face a humanitarian crisis if the deportations continue. This tinderbox has been created by the DR, and the international community and civil society groups within the DR will have to find ways to manage the devastation it is creating.